People ask all the time … why coworking? Why not just keep working from home or from a coffee shop. There are benefits no matter where you choose to work and how you work. But, coworking has it all. 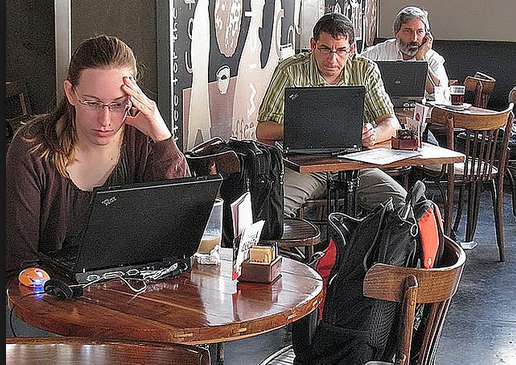 Let’s take a closer look at why coworking beats a coffee shops or the home “office” any day. WORKING FROM HOME: Working in PJ’s is fun and easy. But, if you don’t have a dedicated desk, well, sitting on the floor is comfortable for about 15 minutes. Whatever you do, forget about the dirty laundry in the pile of the room or the dishes stacked on the counter. Or that movie you’re dying to watch. Right, Rover? Ugh. I’m talking to the dog again. I need to talk to a real person. COWORKING: You get a chair. You have a desk. There are productive, fun people around you inspiring you to get your work done and to encourage you to do it even better than you would on your own. And, at ELEVATE, you have a view. And what a view you get from your own private office. WORKING FROM A COFFEE SHOP: There are some perks to a coffee shop, namely coffee, lots of coffee. By 10 a.m. after your third cup of coffee, you might have the shakes and jitters. Typing is tough. Then the phone rings for that important client call. The barista is yelling. A mom with a screaming infant just sat next to you. And, right then, the WiFi disconnects for the 10th time in the last 10 minutes. 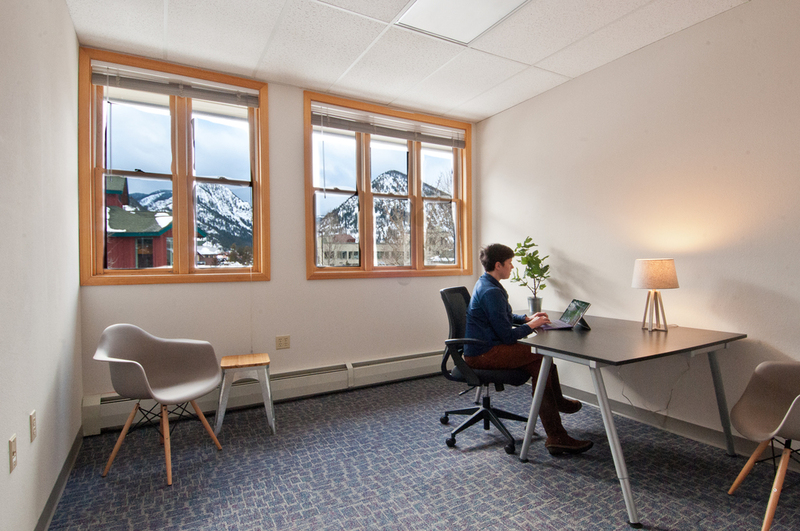 COWORKING: There are a lot of perks to coworking at ELEVATE. Free coffee and tea are just one of them. And, you’re not obligated to drink four cups a day to access the WiFi. You have plenty of elbow room to spread out. You can take that client call without a screaming child. And, the WiFi is the fastest in town. Plus, you’re in an inspiring space with other motivated, savvy people who can “elevate” your projects and work. Three is a magic number for presentations, speeches and other marketing content. Crafting three main points and finding ways to group concepts into blocks of three will give your audience substance while easing the way for them to remember you and to understand your message. The easy-to-remember part is helpful for presenters as well. Anything that builds confidence will release some of the pressure and calm those butterflies you may be feeling. 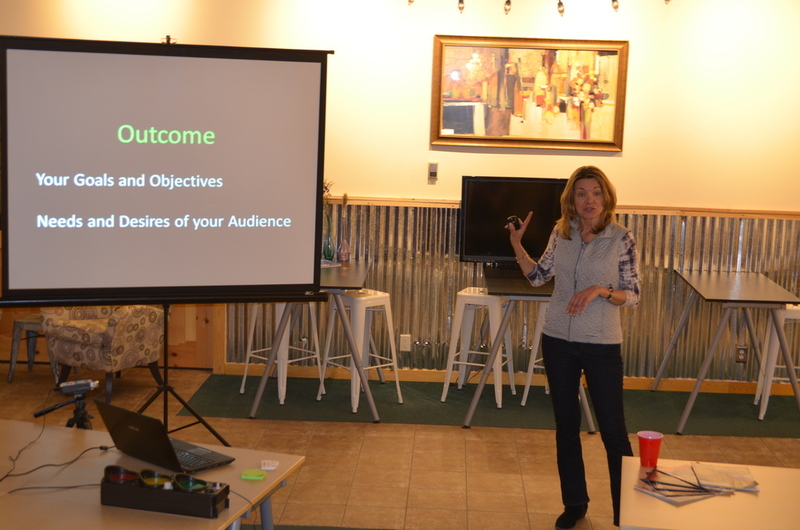 I discussed and incorporated this concept in my “Powerful Presentations and Public Speaking” session on Thursday, January 15 at Elevate CoSpace, the first and only co-working place in Summit County. I was part of their “Elevate Your Biz” series of free seminars. I try to structure every presentation or speech around three core concepts or points. If you’re thinking, “I have too much information to condense into three points!” you are right. You have too much information. Unless you are conducting some kind of half-day/all-day meeting, brevity is your friend. Even if you have an entire day and lots of material, finding a way to categorize and encapsulate your information into three buckets will lead to a better presentation. Since my session was about creating and delivering more powerful presentations, I developed my speech around the three components or steps of every speech or presentation: Content, Delivery and Outcome. This is the chronological order most people follow – first creating the content, then the delivery, and then some kind of result, whether it’s a ‘soft’ outcome like greater understanding or a ‘hard’ outcome like making (or losing) a sale. 1. Outcome: In my experience, it’s best to prepare for any presentation by thinking first of Outcome. What do you expect, hope and want to happen as a result? How do you want your audience to feel? What do you want them to think or do? Identify the outcome you desire and how you can attain your goals by meeting the desires, needs and expectations of your audience. This will better prepare you to begin writing, and help you communicate more effectively. 2. Content: Your content is what you have to say. It starts with a general topic and a clear, overarching point or thesis – think back on those essay-writing days from college or high school! With your key point and desired outcome in mind, plan your content by creating an introduction, the body of your presentation and your conclusion or call to action – another group of three! · For your introduction, you want to start with a spark. Tell a story or anecdote, share an interesting fact or observation, something to immediately grab the attention of your audience. · For the body, follow the general format of three main points or themes, supporting information for each one, and smooth transitions between them. · For your conclusion, finish strong. Appeal not only to logic and reason but emotion. Repeat key information you want them to remember. Use reassuring language. Include the ‘ask’ for any specific decision or action you want them to take. 3. Delivery: This is you actually giving your presentation. In my session, I discussed the importance of body language and vocal variety. If you stand frozen in place or mumble or speaking in a flat monotone, your message will be diluted. Stand tall but relaxed, shoulders back, chin up. Don’t be afraid to look at your audience – if in front of a large group, pick a few friendly faces left, center and right and focus on them. Breathe. Smile! You can fool your audience as well as your subconscious self that you are confident and having a great time. Outcome, Content, Delivery – Give each of these components equal focus and consideration for more powerful presentations and better outcomes. I’ll finish with 3 links (would you expect anything less or more?) to articles that provide additional context on this concept of sticking with three. 3. I talked about the value and importance of adding story to any presentation, whether it’s a one-on-one interview, meeting with clients or high-stake sales pitch. This link, written by a San Francisco arts critic, presents a more literary view of the number three, to help get your own creative juices flowing. Cate is a Content Marketing Consultant, Writer and Speaker with a focus on helping clients and others bridge the gap between knowing and doing. She is an active member of Toastmasters. She is the founder of FastBlurb content services, helping businesses get to the point for attention getting, memorable marketing and other communications. Find her at fastblurb.com or @fastblurb on Twitter.